You can find shuttles and parking off of Terminal Road at San Diego International Airport when you arrive and can find plenty of restaurants to relax at while you are there. Just 3 miles from downtown, you’ll basically be landing in San Diego when you arrive to San Diego International Airport. Make every moment count by not letting the wait-time get you down. You can easily do this by enjoying the amenities, which include an on-site airport museum as well as tasteful food choices and interesting stores throughout each terminal. 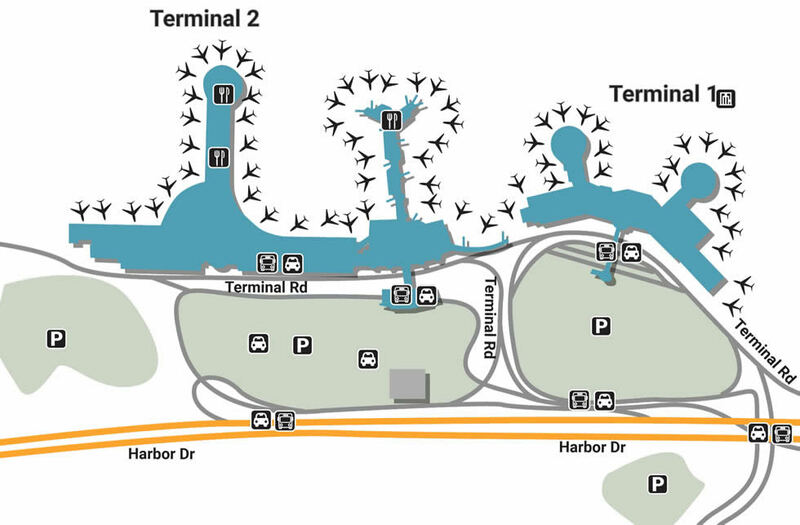 With a simple layout, parking is made simple at San Diego International. The best lots for meeting passengers as well as for easy terminal access are Terminal Lots 1 & 2, located adjacent to Terminals 1 & 2. The Long Term Lot is located at the corner of Liberator Way and Harbor Island Drive, and a bit further down is the free-of-charge Cell Phone Lot along North Harbor Drive. The Economy Lot is the best choice for those planning to stay away for weeks at a time, offering low rates on the north side of the airfield at the corner of Pacific Highway and Washington Street. All the ATMs are located in Terminals 1 and 2, mostly near the shopping area. If you’re traveling abroad and need to switch your currency out, head over to Travelex in Terminal 2 across from baggage claim with another location at Gate 22. There are three separate nursing rooms, two located at the West and East Rotunda of Terminal 1, and the final near Gate 34 of Terminal 2’s second level. If you’re traveling on bike, you can leave your ride in a free bicycle locker, the closest located east of Terminal 1’s pedestrian bridge. Live a little while you wait by splurging at the airport’s coolest stores, one of the most interesting being Bay Books of Colorado, a locally owned bookstore that set up shop at Pre-Security Terminal 1. If you’re planning for some fun in the sun, stop by The Beach House for one-of-a-kind beach apparel, or plan a fun stay indoors with the latest and greatest tech-cessories, both of which are located in Terminal 1’s shopping strip. If the little one needs a special distraction before your flight, pick up something bright and colorful at Kids Love San Diego, located across from security, or treat yourself to upscale California retail at Old Town News & Market (Gate 26). Grab something tasty at one of many delectable restaurants, whether it be the fresh salads and sandwiches at Ciao Gourmet Market, located pre and post-security for Terminal 1, or the Jack in the Box at Terminal 1’s pre-security. If you’d like a whopping burger that’s sure to leave you satisfied, head to The Counter: Custom Built Burgers, located at Terminal 1, Gate 4. If you’re in Terminal 2, there are just as many places to eat, including Elegant Desserts (Gate 38), home to cookies made from scratch as well as jarred desserts. There’s also freshly grilled seafood at Bubbles Seafood and Wine Bar (Terminal 2’s Sunset Cove), a local eatery that offers San Diego’s best.